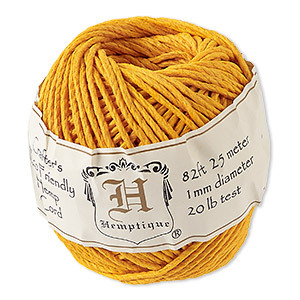 Cord, Hemptique®, polished hemp, metallic gold and natural, 1mm diameter, 20-pound test. Sold per 98-foot spool. Item Number: H20-3315BS Have a question about this item? Add an edge to homespun designs with shimmers of metallic gold color. 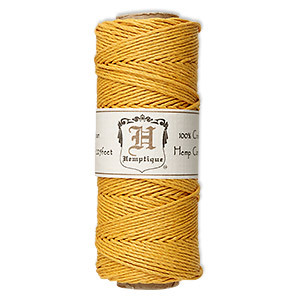 Gold-colored thread is tightly woven into natural hemp fibers for a little bit of flash. 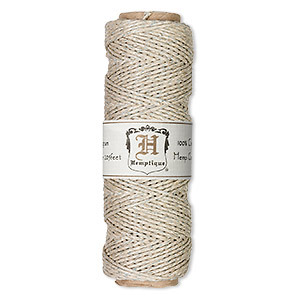 Hemp cord has a smooth, polished texture. Small 1mm diameter for stringing gemstones and other beads with smaller drill holes. Hemp cord passed a 20-pound strength test. Cord size can vary up to 0.2mm on the strand. Color may vary from dye lot to dye lot. 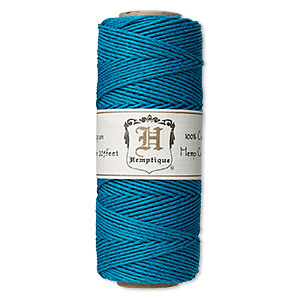 Cord, Hemptique®, hemp, metallic turquoise blue and natural, 1mm diameter, 20-pound test. Sold per 98-foot spool. 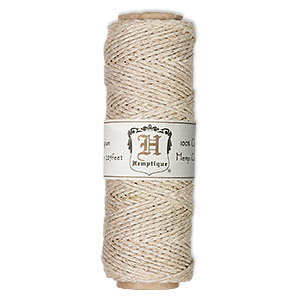 Cord, Hemptique®, polished hemp, natural, 1mm diameter, 20-pound test. Sold per 750-foot spool. Cord, Hemptique®, polished hemp, gold, 1mm diameter, 20-pound test. Sold per 205-foot spool. 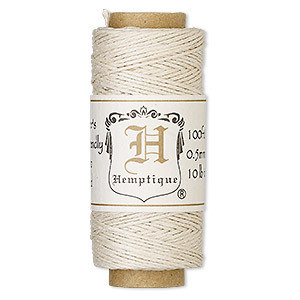 Cord, Hemptique®, polished hemp, gold, 1mm diameter, 20-pound test. Sold per 82-foot ball. 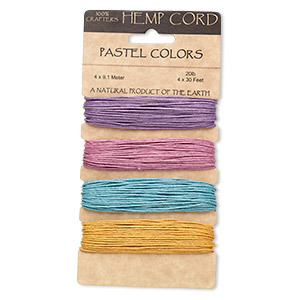 Cord, Hemptique®, hemp, assorted colors, 1mm diameter, 20-pound test. Sold per pkg of (4) 30-foot sections. 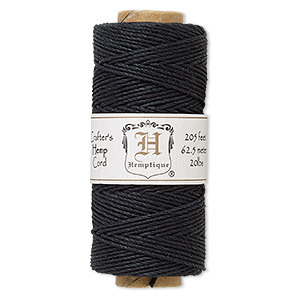 Cord, Hemptique®, polished hemp, black, 1mm diameter, 20-pound test. Sold per pkg of 205 feet. 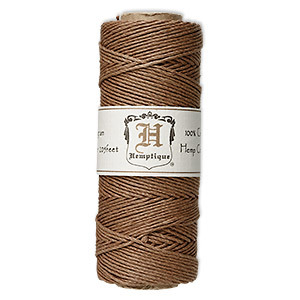 Cord, Hemptique®, polished hemp, light brown, 1mm diameter, 20-pound test. Sold per 205-foot spool. 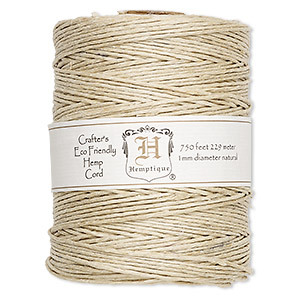 Cord, Hemptique®, polished hemp, natural, 0.5mm diameter, 10-pound test. Sold per 100-foot spool. 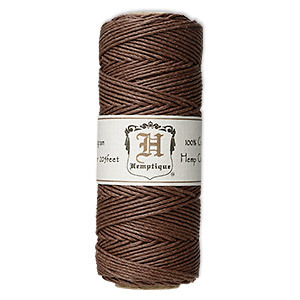 Cord, Hemptique®, polished hemp, dark brown, 1mm diameter, 20-pound test. Sold per 205-foot spool. Cord, Hemptique®, polished hemp, turquoise blue, 1mm diameter, 20-pound test. Sold per 205-foot spool.